Decisions, decisions. Where to visit on your next holiday this coming season might be a question you have been pondering for this year. Should the sea be calling, then why not a yacht charter Turkey or Greece holiday to some of the most favored destinations on board the gulets that can take you there. Well the most popular places firstly for embarking are the wonderful harbors of Bodrum, Marmaris or Fethiye; and the charming port of Gocek. From these breathtaking seaside cities and towns, the choices in destinations are nearly endless. If you are thinking more along the lines of island hopping, then a Turkey yacht charter to the ancient Greek Islands will satisfy your travels in the Dodecanese and Cyclades. 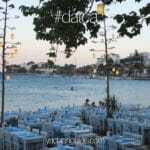 This is especially possible if you are starting your gulet charter from either Bodrum or Marmaris. However if you prefer to stay in Turkish waters and enjoy your gulet cruise between the Mediterranean or Aegean regions, again the above embarkation points are ideal. From Gocek or Fethiye you can take your cruise in Turkey to the Yassica Islands or otherwise known as the 12 islands of Gocek. There is also a very history rich journey past Gocek and over to the town of Dalyan where you can visit the ancient city of Caunos for a look-see at the incredible Lycian Rock Tombs. When it comes to itineraries and all the combinations available, discussing it with your yacht charter agent may guide you in making a decision that may bode well in the end. Gulets also offer a great selection. Based on your criteria, again a yacht charter agent can help you shortlist and choose a gulet that is right for your yacht charter travels. 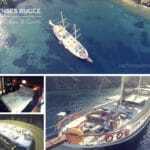 A few of the popular gulets that are booked during the season might help you get started on what size, style and price you are looking for, for your boat charter Mediterranean or Aegean holidays from Turkey. 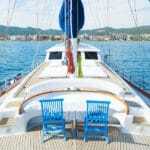 Exquisite forward deck area of the Papa Joe gulet – Tempting maybe? In the mood for almost high class accommodation that would leave 5 star hotels in the dust? The ever so popular and also asked for by name is the not-quite-legendary but desirable Papa Joe gulet. She is rather a shining star in the gulet charter arena. Boasting 38 meters in length, the Papa Joe gulet offers luxurious cabins, and if you book her early enough, it might add quite a handsome bonus to your travels. 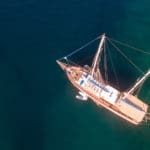 So what will it be – a yacht charter Turkey or Greece holiday for you in the new summer season of gulet cruises in Turkey? What will your gulet choice be? Find out soon before all the favorites are all booked up!